As technology evolves and transforms the way we work, we’re increasingly called on to perform complex tasks with others. So what makes for successful workplace collaboration? How does collaboration improve employee satisfaction and motivation? Even more, how does increased collaboration create more value for companies? Our 2018 International Work Perceptions report gathered data from nearly 7,000 knowledge workers in 17 countries. We asked them what makes for good (and bad) collaboration, what they value at work, and how they perceive their company’s values. The resulting report delivers crucial insights into what difficulties workers face today, how collaboration can spur innovation, and how managers and leaders can support teams as they embark on an increasingly interdependent nature of work. Part 4: What makes for good team collaboration? While companies aspire to be profitable—a quantifiable measure of corporate success—this shows that employees see the bigger picture on how to achieve that success: by focusing on customers and investing in employees. When companies invest in employees, they take care of their individual needs, including competitive compensation, opportunity to master skills, efficient processes/reduced bureaucracy, and adequate autonomy. When individual employees have that backbone of support, they can fulfill their team needs by fostering successful collaborations. Collaborations based on clear communication, clear responsibilities, and mutual trust help provide value to customers. An added bonus is that healthy collaboration practices make workers happier too. As employees progressed through their careers, the glimmer of external signifiers like brand recognition and global reach faded, while priorities like focus on customers, clear leadership, and investment in employees became more important. 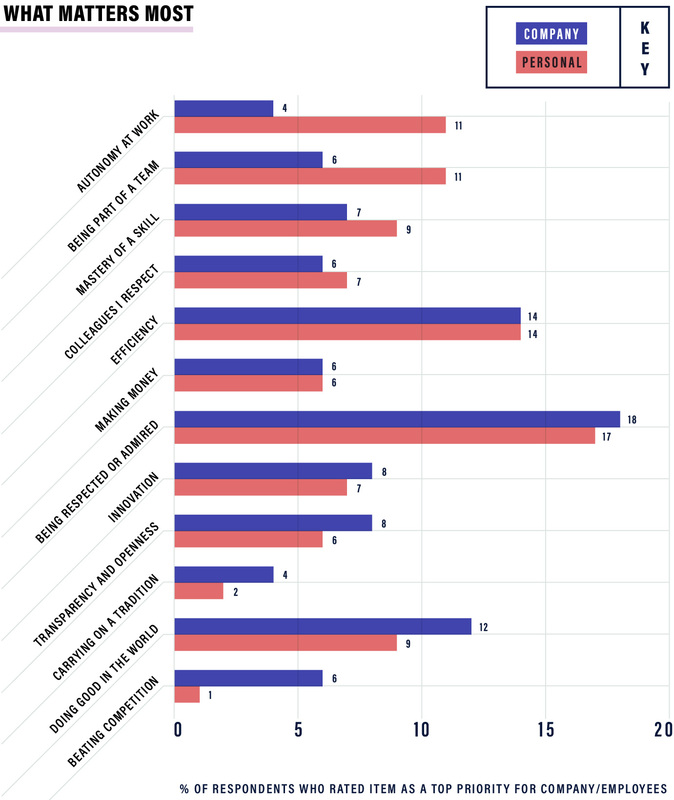 The answers chosen by the most experienced workers aligned with management’s priorities, likely because manager-level employees tend to be more experienced. Our respondents were eager to share what mattered most to them at work, and what frustrated them. 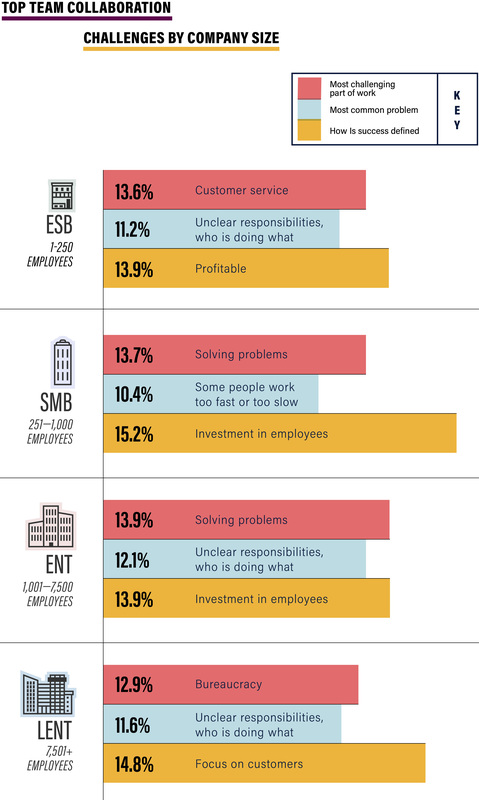 Employees felt both they and their company valued “making money” and “efficiency” the most. But beyond that, perceived employee and company values diverged. Workers felt their companies valued “doing something new and innovative” quite highly. Employees also wanted innovation, but they thought “having autonomy” and “being part of a team or community” were more important. If companies focused more on championing employees and recognizing their value to the organization, they’d also be working toward long-term success and profits while taking better care of their employees. 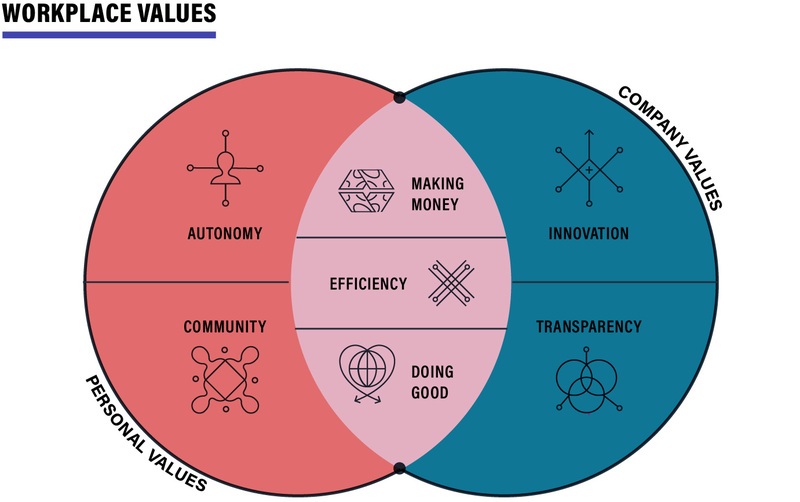 Workers from various countries, company sizes, and roles, chose “making money” and “efficiency” as their top values at work, and they felt those priorities aligned with their company’s top values as well. Whether among health care workers, teachers, or customer support, studies show that autonomy—often defined as feeling like you have a choice in how to achieve your day-to-day work—is a key attribute of job satisfaction. Autonomy leads to higher retention rates and greater productivity. And yet, the single biggest gap between what workers value, but think their companies don’t, is autonomy. For workers, this was the third highest priority. For their companies, they saw it as the 11th priority—below hiring good people and fostering a community. A longitudinal study showed that even a little bit of autonomy makes workers happier about other parts of their work life such as their pay, job challenges, and promotion prospects. People might leave jobs they like because they don’t get along with their manager. But they might stay at jobs they don’t love if they have a high degree of autonomy. Which workers value autonomy most? 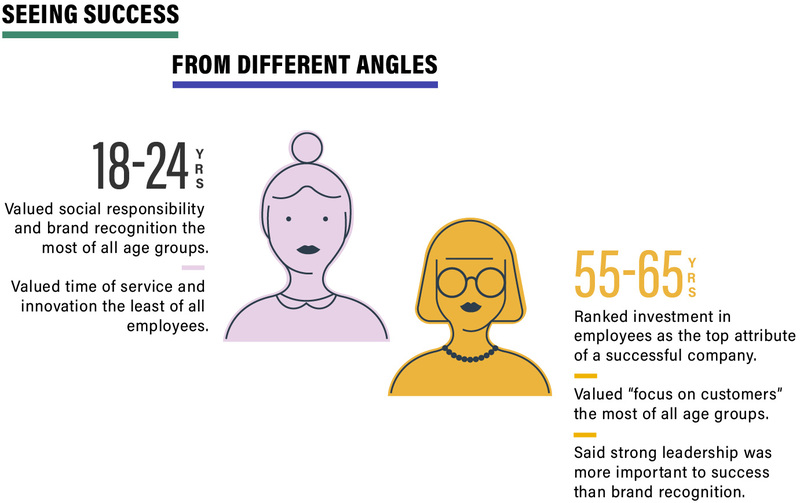 In our study, how much employees value autonomy differed the most across generations and work experience, rather than company size or industry. Workers age 18-25 value autonomy less in favor of innovation, while more experienced workers, age 45-65, (45+) value autonomy more than their younger counterparts. Perhaps unsurprisingly, employees who are 55 and older value it the most. For workers age 18-24, trusting colleagues to do good work is a top collaboration concern. Workers in the 25-44 range prized clear responsibilities as the key to good collaboration. Workers age 45-65 characterize good workplace collaboration as being able to communicate with colleagues easily. There is a “circular relationship” between collaboration and autonomy: Collaboration with colleagues leads to more autonomous work being created, and autonomous initiatives often lead to meaningful work with colleagues. As teams grow in size and complexity, it can get harder to share information quickly and efficiently. If teams are not clear in what needs to be done, then the benefits of autonomy decrease. In short, giving employees more autonomy doesn’t matter if your teamwork isn’t up to par. Teamwork can be even further complicated when you’ve got workers in multiple countries. Time zones, language barriers, and cultural differences can make things harder on global teams. Workers in the same company may have very different styles at the Beijing office than they do in the Bangalore office. Our survey found a few of the fault lines. For those based in, or managing people in, countries outside the U.S., Slack’s survey revealed unique challenges. We are continuing to research country- and region-specific insights, but for now, here are highlights from our survey. Developing economies: Busy and populous India and Brazil were two of only a few countries where a significant number of respondents thought there was too much collaboration. U.S.-U.K. symmetry: Workers in the United States and United Kingdom valued making money highly (19% and 20%, respectively), relative to those in other countries. And the U.S. and U.K. were the top two nations ranking “employee morale” as a problem at work. Let’s get along: Workers in Japan rated “everyone agrees on goals or outcomes” higher than any other country surveyed (19%). Other countries valued it around 11%, on average. Defining success: Twenty-nine percent of German workers said “making money” was the most important thing to them at work, a far higher percentage than any other country. Workers in Germany were the only ones to rank “winning/beating the competition” in their top five company values. Top-down problems: Ten percent of French respondents rated “hierarchy” as a top personal challenge at work, highest of all countries surveyed (Norway and U.K. were second and third). Likely related, France was also the top nation to report “maintaining autonomy” as a challenge. Being cognizant of culture- and country-specific challenges can help global teams collaborate better. Awareness that French employees, for example, have more trouble navigating corporate hierarchy than colleagues in India can be helpful when planning shared projects. Once aware, open and honest conversations about difficulties—whether they’re cultural, regional, or national—fulfill one of the key elements of good collaboration: communication. 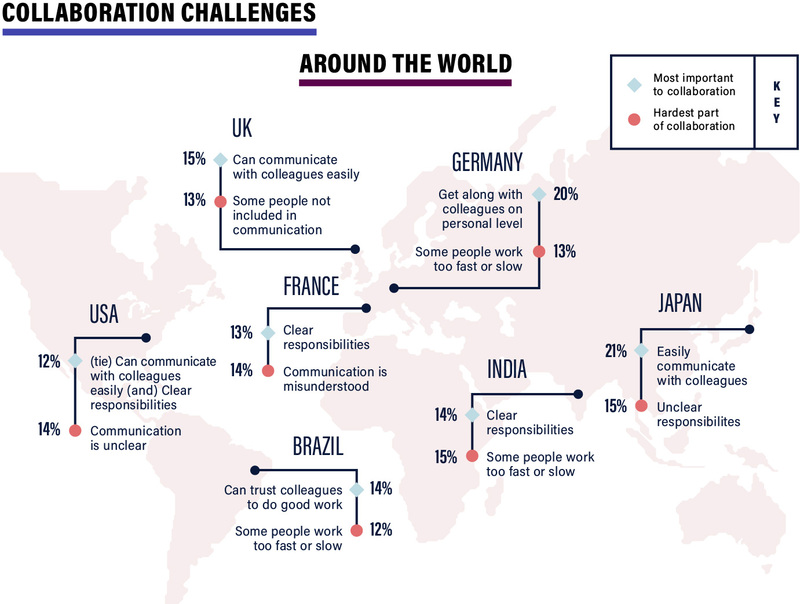 Conversely, top collaboration challenges overwhelmingly centered around communication difficulties. For example, in person we can hear someone’s tone of voice and see their facial expressions. Gestures help us understand what someone is trying to express. But those valuable cues can be obscured, misconstrued, or lost altogether in modern communication tools like emails and texts. So how do we jump these hurdles to collaborate effectively? Our respondents thought investing more in trust and visibility would help. Namely, ensuring people are being kind to coworkers, and that goals and responsibilities are explicit and visible to all. This may be easier to achieve in companies with fewer workers. As companies grow and scale, their employees face new difficulties when working together. Employees value whatever helps them fix their company’s current problems. As organizations grow, both the company’s goals and employees’ skills and knowledge needed to reach those goals change. For example, for the smallest businesses in our survey, workers needed help figuring out who is doing what to ensure the company’s profitability. In the largest enterprises, profitability was established, but workers were mired in layers of bureaucracy that kept them from spending more time serving clients. To best help workers stay on track, managers need to focus on fixing size-specific collaboration challenges and prepare for the next set of hurdles that come with growth. People who worked at Emerging Small Businesses were most concerned with survival: basic profitability. This concern is extremely valid. After five years, less than 50% of newly founded businesses in the U.S. still exist. ESB workers were concerned with serving clients, so they value a high degree of autonomy in order to address customer needs as fast and as accurately as possible. Each employee’s contributions have an outsize effect on the business, so these small businesses lean extra hard on employees being talented and autonomous to keep the lights on. As companies grow larger, the problems they need to solve grow more tangled, but so do their network of problem-solvers. Companies add more people, more teams, perhaps even more offices in different time zones, using a larger array of tools, software, and processes. Workers at these mid-size companies seek clarity of function, and want their companies to invest in them so they can gain more skills. For managers and leaders, additional investments in employee professional development can lead to innovation that helps to solve increasingly knotty collaboration problems. The largest employers faced even tougher hurdles. Process and hierarchy slowed work to the point where employees felt hamstrung when trying to respond to customer needs. Balancing autonomy of individual employees while maintaining alignment and clarity of purpose becomes tricky. Shared communication systems can help by making information widely visible and useful across the organization. But this is also where managers should step in as well. Without them, workers simply may not be able to get past internal bureaucracy to create the solutions that enterprises of this size require. The changing values for companies as they progress from ESBs to larger corporations, and the changing needs of their workers, suggest that larger enterprises would be able to harness more of the innovation they list as a “top company value” if companies and managers allowed employees greater autonomy to pursue it. Although there are clearly a lot of pain points that employees today face, particularly around collaboration, there are ways that managers can help (with resources and the company’s blessing). Here are some ways managers can help employees work better together, and individually, regardless of company size. Create the foundations for clear communication and employee trust. As “unclear communication” is the top collaboration challenge for all employees, you must create a culture of mutual trust so workers feel empowered to say what they actually mean instead of dancing around it. For ESBs and Small-Medium Businesses, this might include things like making sure there are guidelines around using professional and respectful tones in communications, something ESBs and SMBs rated higher as a collaboration challenge than Enterprises (ENTs) and Large Enterprises (LENTs). Survey respondents reported it was very important to have “mutual respect and trust,” “kindness and respect,” and “professionalism” in order for them to be able to have healthy collaborations. Reduce institutional barriers to healthy collaboration, such as bureaucracy. This is especially important for ENTs and LENTs due to the number of people, teams, and institutional structures in place. Rigid, standardized processes may tick all the boxes for executives, but they shoehorn projects into a certain shape rather than flexing to fit. Some things companies have done to balance accountability with autonomy: create small, cross-functional teams to manage projects independently; designate an “executive champion” to help get projects on C-level radars; or train team managers to be both task- and relationship-oriented. Make responsibilities clear. Make it absolutely clear (and posted!) who is doing what, and when. As one surveyed worker said, collaboration “is when roles are well-defined and all actions are done.” Visible, updated organization charts can help achieve this. Particularly for new hires or workers at larger organizations, an internal wiki of shared company knowledge (e.g., who approves budgets) can be a major timesaver. Increase autonomy for more experienced workers. Allow employees increasing autonomy as they grow in their career—but make sure they have the right resources to wield that autonomy effectively and creatively. Workers who are 40+ especially desire autonomy and are likeliest to have the experience, knowledge, and resource access to drive exciting, large-scale projects. But without the decision-making power to bring those projects to fruition, they won’t be able to share their full skill set with the company. As the employees with the most experience, it would be fiscally savvy to harvest their accumulated skills as much as possible. Provide time and resources for creative projects. A study about how autonomy helps companies stay competitive suggests that managers who want to “yield economic results” should not only grant autonomy, but also provide a support structure for employees to exercise that autonomy. There were three activities the study’s authors specifically recommended to enable this: encourage employees to work on their own ideas; give them time for creativity; and allow employees to initiate intrapreneurial activities. These projects tend to be more successful than those imposed on them from outside, and they provide multiple self-driven opportunities to collaborate with colleagues. This increases trust and collaborative sufficiency for other company projects, creating a cycle of rewarding behavior and outcomes. Drawing on the data we’ve found, as well as outside sources, such autonomous projects might be especially satisfying for the most experienced workers, who both desire autonomy and have the experience and knowledge needed to guide big ideas into real projects. 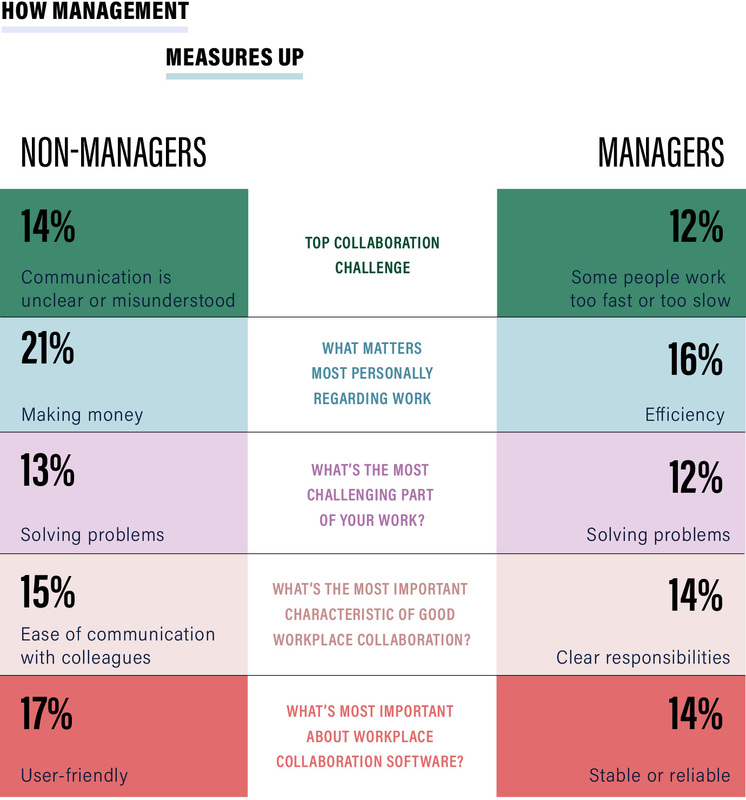 Our survey showed many similarities in how managers and non-managers think. But for some issues, there were differences of opinion. Non-managers seemed more concerned with clear communication, while managers fretted about the pace of work. Similarly, non-managers wanted good communication in collaboration, while managers prized clear responsibilities. However, managers and non-managers agreed that “solving problems” was their key challenge at work. It could be that they have different problems. Or that they can help solve one another’s problems. If managers do not clearly communicate what needs to be done, then workers have to spend time trying to figure it out instead of on their project. Our survey saw that non-managers reported “knowledge management/getting answers” much higher than managers did, showing at least some workers are struggling to get the information they need to get work done. One concern that may be driving managers is the fear of being outpaced technologically. The 2018 PricewaterhouseCooper survey of CEOs showed this fear increased from 11% in 2013 to 44% in 2018. And no wonder: As technology increases in both complexity and adoption, the world is becoming a smaller and more competitive place. 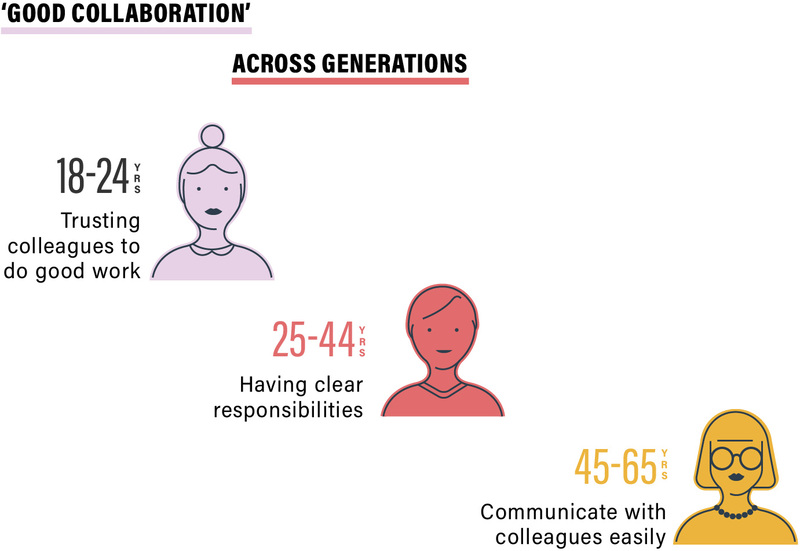 It’s striking that people from around the globe, from teenagers to those in their 60s, agreed on what made for good team collaboration: easy communication, mutual trust, and clear responsibilities. Their everyday challenges may vary by location, industry, or company size, but they all seemed to crave simple things, namely, the right tools to do their job and the power to make decisions. The good news is that giving them those things is a win for both companies and workers. In fact, giving workers more autonomy and more chances for collaboration, drives innovation while boosting morale—and that’s something all companies can benefit from. This 2018 survey consisted of an online questionnaire with 27 questions, administered to nearly 7,000 knowledge-workers across 17 countries. Dr. Michael Massimi, staff researcher at Slack, created this survey in collaboration with FactWorks. The survey was unbranded and median survey time was 10 minutes. We used a stratified sample of 100 responses per company size segment, for a total of 400 responses per country. “Job Autonomy and Job Satisfaction: New Evidence,” by Anh Ngoc Nguyen, et al. Lancaster University, March 2003. What do workers want? Trust, tools, and teamwork, according to our first Future of Work Study conducted by Kelton Global.